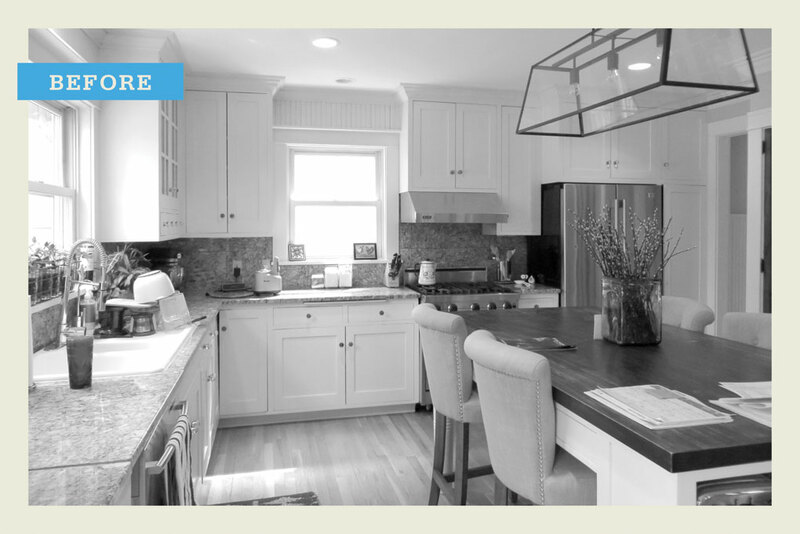 The Richards’ remodeled kitchen shows off its new cabinetry, marble countertops, and lighting. After a whirlwind six months from first date to wedding, Bill and Kristina Richards snuggled into their new life together in her 1,200 square-foot south Minneapolis bungalow. Chief merchandising officer for local clothing retailer Evereve, Kristina had moved here from Chicago eight years earlier; Bill, a real estate asset manager with Wildamere Capital Management, was a new transplant from the Windy City. Now each had double the family—all 400 miles away and itching to visit. So the hunt began. The closer to a lake the better, they agreed, casting a net far into the suburbs and eventually tugging back to Minneapolis’s urban cluster to shorten their commutes. 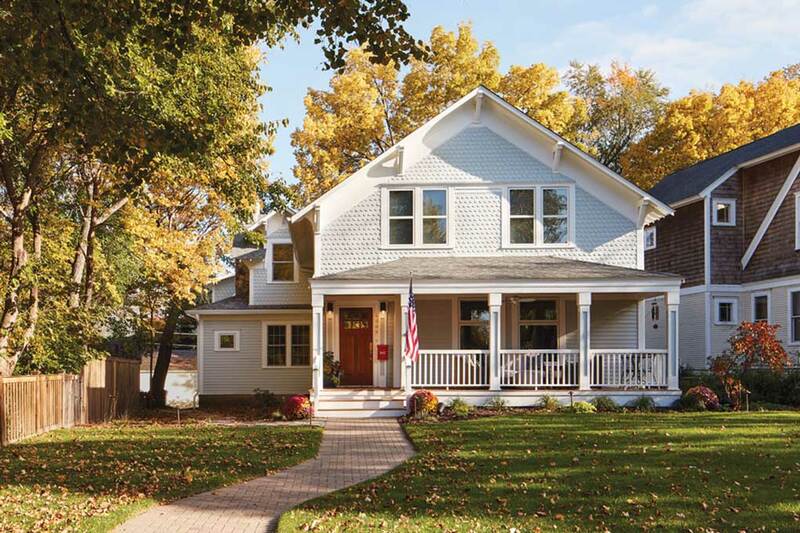 When Kristina’s online research turned up a character-filled 1900s Linden Hills fixer-upper, tucked between lakes Harriet and Calhoun, her heart skipped a beat. “That’s our house!” she said. 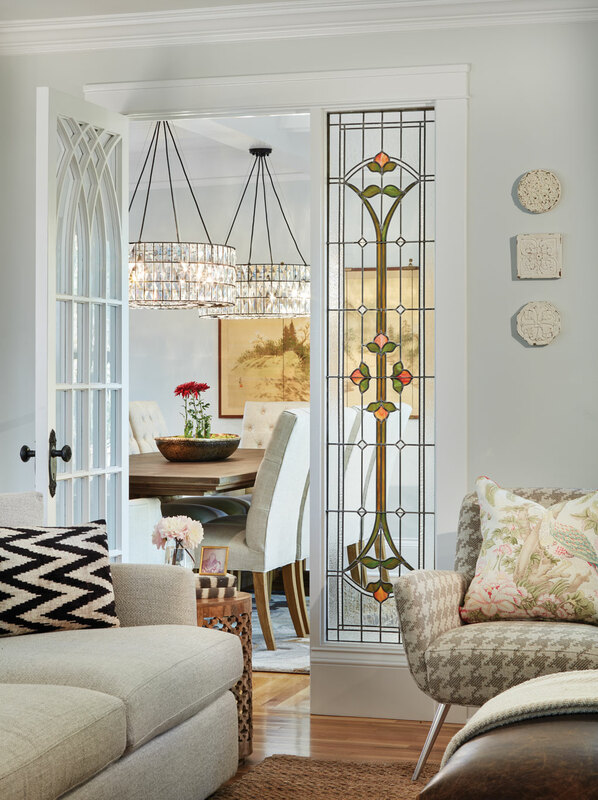 At the showing, Kristina fawned over the stained glass and detailed woodwork at the home’s core, part of the original 800-some-square-foot lake getaway that had been added onto over the years. She was unfazed by the patchy, uneven floors, falling-down garage, and more that left Bill, well, extremely unconvinced. After a few more days of searching, they scheduled a second showing and flipped roles—Kristina looking past the period details to better understand the amount of work required, and Bill doing the exact opposite. With well-rounded joint awareness of strengths and challenges, the couple factored in the walkable, lake-blessed location, and finally agreed: The house must be theirs. As their brief courtship attests, these two act quickly when they know what they want. They moved in two months later. Vintage charm abounds in the living room, where the broad windows with restored stained glass open to the old-fashioned front porch. Meetings with builder Kerry Hage of Hage Homes, whose work they’d admired during their home search, and Mark Larson of Rehkamp Larson Architects, helped them creatively trim their lengthy dream list with attention to budget realities—a spacious library addition and expanded, finished basement, for example, didn’t make the cut. “It’s always about finding the balance between what you want to accomplish and what you want to spend,” Larson says. Eventually, the final plan took shape. They’d fix all the many maintenance issues inside and out, smooth distinctions among past additions, spotlight the 1900-vintage details that initially drew them in, and, of course, create plenty of comfortable places for guests to unwind. The garage was the first order of business. They needed a new one, and they wanted guests’ quarters above it. After learning that city zoning laws prohibited an upper-floor bathroom in a detached garage, attaching it seemed the best work-around. This opened up the backyard, as well as many other possibilities that have since become well-used favorites. Like the mudroom, a lovely wallpapered landing spot with built-in space to hang coats and bags, and the laundry area, with space-saving amenities such as a drawer for soap and other essentials tucked between the washer and dryer. And, just off the mudroom, a sliver of square-footage added between the existing home and the property line is just big enough for a built-in desk and book-lined reading nook, wedged on either side of a chimney’s stone exterior. The home’s original fish-scale cedar shakes are repeated on the addition. Up a short staircase, the garage-top guest quarters unfolds with a daybed, hide-a-bed sectional, game nook, and private bath. 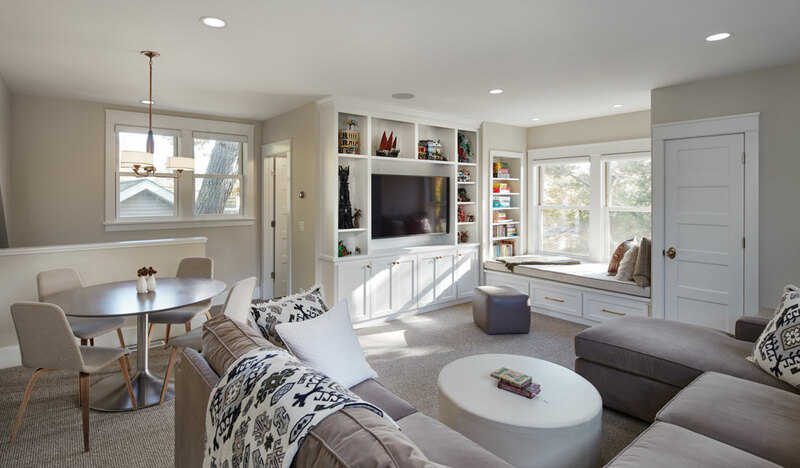 It’s evolved into a multi-use media room for guests, yes, but also for casual off-site business meetings, The Bachelor-watching parties, and quiet, decompressing Friday evenings. The versatile space above the new attached garage functions as guest suite, office, and media room. The other three more modest upper-floor bedrooms were fine-tuned and painted. Taking a cue from bed and breakfasts, they are decorated in subtle themes adopted as names—The Bird Room, The Garden Room, and The Lake Room—revealed by small paintings hung on each door, and their closets are stocked with suitcase racks, robes, and wooden hangers. A shared hallway bath stole excess space from the upper floor’s landing, making it large enough for distinct sink and toilet-and-shower areas, separated by a pocket door, so one guest’s shower doesn’t prohibit another’s ability to get ready in front of the bathroom mirror. Most main-floor updates were made in the interest of maintenance and cohesion, though a broom closet became a dry bar off the dining room to help with hosting. 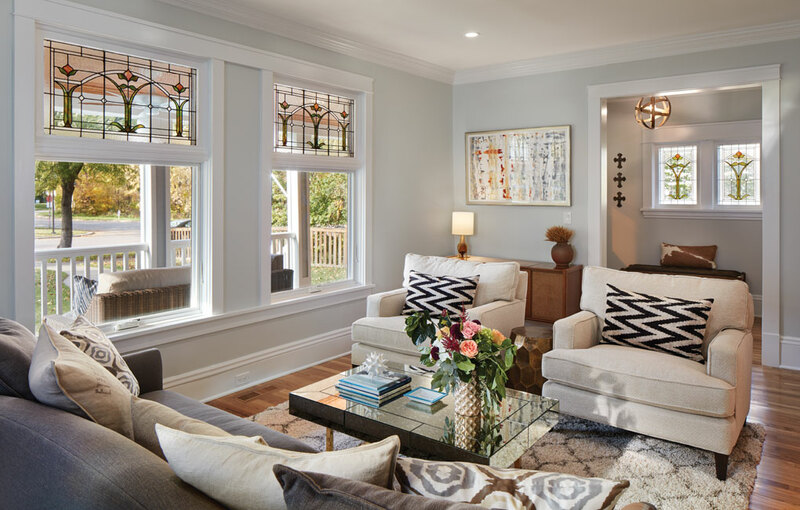 Builder Hage installed new windows with a framework to hold the old stained glass and saved hand-carved newel posts, wood flooring, and plenty of the original hardware, too. Updates in the master bedroom include built-in bookshelves, revamped headroom, a reconfigured bath, and an expanded walk-in closet. 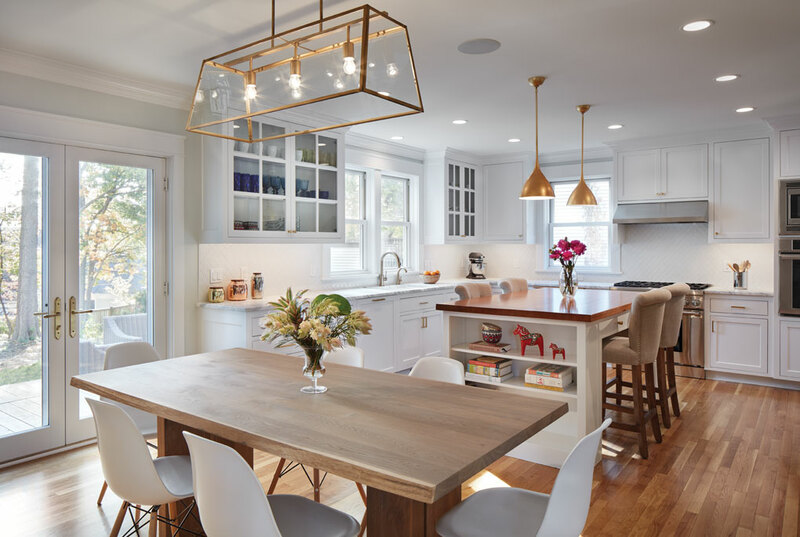 With inspiration culled from design bloggers like Becki Owens, Kristina riffed off the fixed home elements to juxtapose old and new, and hard and soft throughout. Gold-painted and crystal light fixtures mingle with artwork painted by relatives and local artists, found online and purchased at flea markets and fairs; as well as furniture and furnishings found at Room & Board, HomeGoods, and other home stores, almost all purchased specifically for this space. Interior designer Renee LeJeune Hallberg of RLH Studio helped with lighting, artwork placement, and other design choices the couple found overwhelming. Outside, careful attention was paid to match the addition to the rest of the home in every detail, from the overall scale to fish-scale cedar shakes. “Someone driving by would never suspect it had gone through such an incredible improvement,” architect Larson says. Builder Kerry Hage installed a new framework to hold the old stained glass window between the family and dining rooms. Berit Thorkelson, a longtime freelance writer specializing in home and travel topics, is basically a professional adventuring snoopy person. Her own interior style tends towards the eclectic and original—a salvaged church cabinet and a pair of checkout-lane lamps grace her own living area. She always wants the extended version of your home tour.